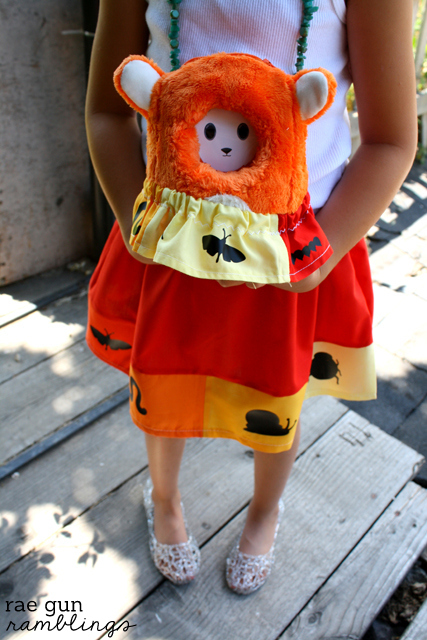 When I showed up with this bug skirt complete with a bug skirt for the little Ubooly interactive toy the nieces were in love. It’s probably shameful of me for never thinking of making their toys and dolls clothes before but they absolutely loved the idea of the coordinating garment. This skirt came together so quickly and easily that once they started to fight over who was going to wear it (I know I should know better than to make just one of something) I told them that they could make their own. 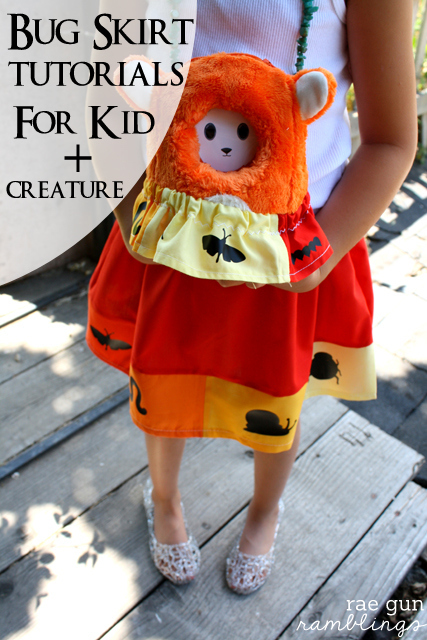 Yup I’ve started to teach them how to sew and these simple skirts are great beginner projects. 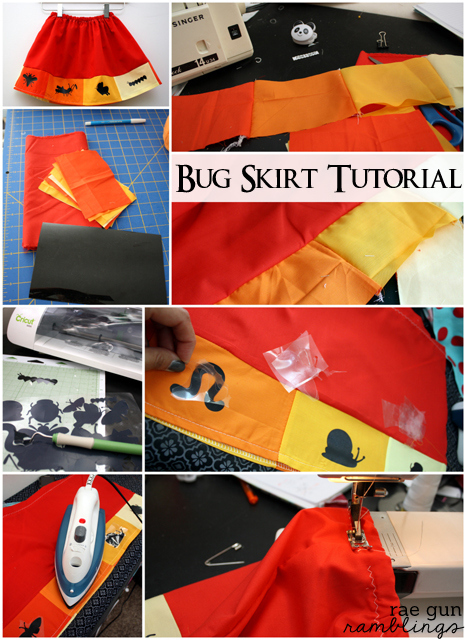 But before we get to that here’s a fun bug skirt tutorial thanks for the supplies and challenge Cricut and Ubooly! Sew the band pieces together along the 5″ sides making a long strip. Sew the strip to the bottom edge of the main skirt fabric. Finish the hem and make a casing for the elastic at the top of the skirt. 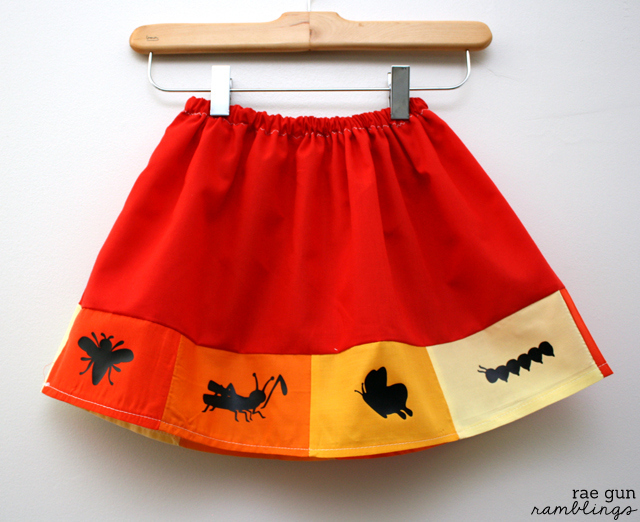 Cut images out of vinyl the bugs were about 2 inches tall for the kid sized skirt. Remember if your image is directional to do the mirror image before you cut. Place the vinyl plastic side DOWN on the cutting mat and use the vinyl or kiss cut setting. Weed images and cut apart. Arrange vinyl with the plastic side up on the band and hold iron for 5-10 seconds on each image repeating as necessary until fully attached. Repeat for all images. Pull off the protective plastic covering. Lay a piece of fabric on top of each image and press through the fabric one more time. String the elastic in the casing and sew shut and you’re good to go. Sew panels together along the 4″ sides to form a tube. 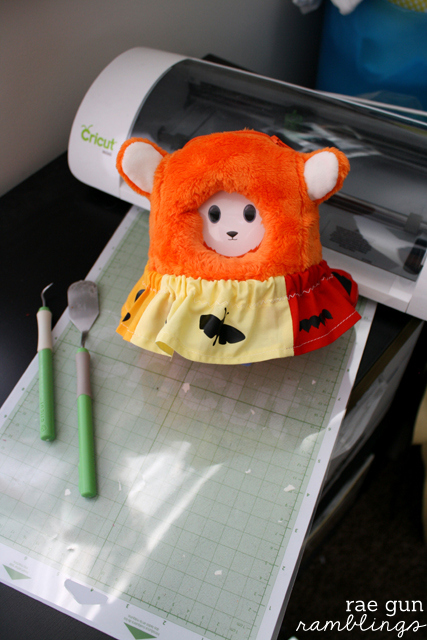 Hem the bottom and make a top casing. Cut images out on the Cricut (the bugs were about 1 inch tall for the mini skirt). Weed and cut apart. Iron the vinyl on to the skirt as described above. String and sew in the elastic waist band and you’re good to go. 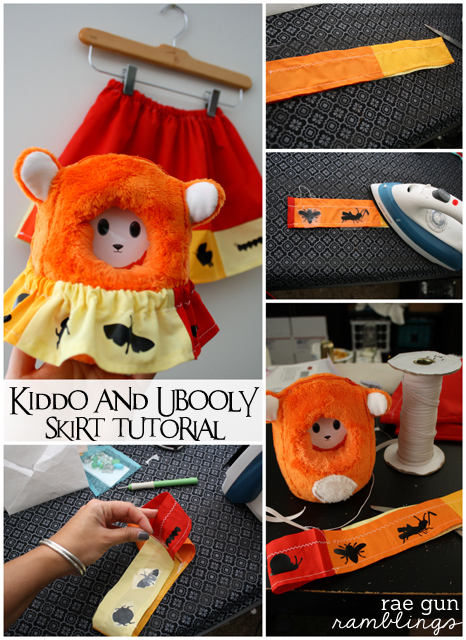 I’m excited to have the girls make their own skirts. I love how the Cricut Craft room has so many images so we can use the same basic easy technique but with different fabrics and images they can have very different looking skirts that are totally personalized. Who want’s to bet that T makes herself a super hero one and the L goes for something princess-y? I love how Summery this turned out. I may have to ahem make myself one. Do you think it would work on an adult? 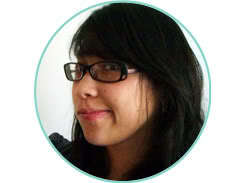 This is adorable Marissa! Very very cute! Love the cute skirts! Loving the bugs!!! Absolutely love the skirt! How fun!